Siklos® is available in 100 mg film-coated tablets and 1,000 mg triple-scored (4 x 250 mg) tablets to allow dose adjustment based on patient body weight and clinical response. Where both strengths of Siklos® (100 mg and 1,000 mg) are prescribed simultaneously, make sure that the patient and/or the parents or caregivers understand the prescription in order to avoid confusion. Do not split 100 mg tablets. Siklos® 1,000 mg triple-scored tablets allow dose adjustments in increments as small as 50 mg* to help optimize dosing. *Beginning at a 200 mg dose. Important: Siklos® 100 mg tablets must NOT be split into smaller parts. Siklos® 1,000 mg triple-scored tablets allow further customization by permitting dose adjustments in increments as small as 50 mg (beginning at a 200 mg dose). Daily dose should be adjusted based on patient body weight and clinical response. Starting dose is 15 mg per kg per day. The usual maintenance dose is between 15 and 30 mg/kg/day. In some exceptional cases, a maximum dose of 35 mg/kg/day may be justified and administered under close monitoring of blood counts. Initial Recommended Dosing 20 mg/kg once daily based on patient’s actual or ideal weight, whichever is less. Monitor the patient’s blood count every 2 weeks. Increase dose 5 mg/kg/day every 8 weeks or if a painful crisis occurs. Give until mild myelosuppression (absolute neutrophil count 2,000/uL to 4,000/uL) is achieved, up to a maximum of 35 mg/kg/day. Increase dosing if a painful crisis occurs. Recovery Reduce dose by 5 mg/kg/day. Dose Modifications for Renal Impairment Reduce dose by 50% in patients with creatinine clearance of less than 60 mL/min or with end-stage renal disease (ESRD). Obtain creatinine clearance using a 24-hour urine collection. (mL/min) greater than or equal to 60: recommended initial dose: 20 mg/kg daily. (mL/min) less than 60 or ERSD (On dialysis days, administer Siklos® to patients with ESRD following hemodialysis). Monitor the hematologic parameters closely in these patients: 10 mg/kg daily. Please see Dose Modifications for Renal Impairment in Section 2.2 of PI. Patients and/or caregivers must be able to follow directions regarding drug administration and patient monitoring and care. Fetal hemoglobin (HbF) levels may be used to evaluate the efficacy of Siklos® in clinical use. Obtain HbF levels every three to four months. Monitor for an increase in HbF of at least two-fold over the baseline value. Evaluate hematologic status prior to and during treatment with Siklos®. Provide supportive care and modify dose or discontinue Siklos® as needed. Recovery from myelosuppression is usually observed within 15 days when therapy is interrupted. Resume therapy after interruption at a lower dose. Based on the mechanism of action and findings in animals, Siklos® can cause fetal harm when administered to a pregnant woman. Advise women of the potential risk to the fetus. Advise females of reproductive potential to use effective contraception during and after treatment with Siklos® for at least 6 months after therapy. Advise males of reproductive potential to use effective contraception during and after treatment with Siklos® for at least 6 months after therapy. Cutaneous vasculitic toxicities, including vasculitic ulcerations and gangrene, have occurred in patients with myeloproliferative disorders during therapy with hydroxyurea. These vasculitic toxicities were reported most often in patients with a history of, or currently receiving, interferon therapy. Concomitant use of Siklos® with a live virus vaccine may potentiate the replication of the vaccine virus and/or may increase the adverse reactions of the vaccine virus, because normal defense mechanisms may be suppressed by Siklos® therapy. Vaccination with a live vaccine in a patient taking Siklos® may result in severe infections. 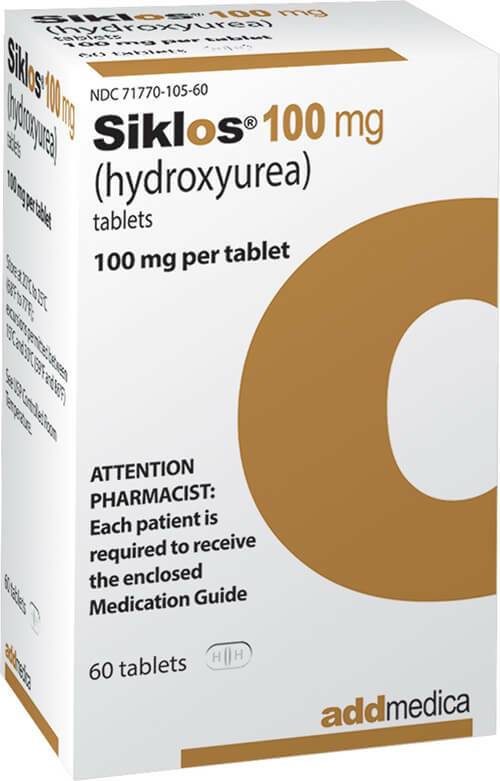 Pancreatitis, hepatotoxicity, and neuropathy have occurred when hydroxyurea was administered concomitantly with antiretroviral drugs, including didanosine and stavudine. Generally, the patient's antibody response to vaccines may be decreased. Treatment with Siklos® and concomitant immunization with live virus vaccines should only be performed if benefits clearly outweigh potential risks. Consider consultation with a specialist. Avoid use of live virus vaccine in patients taking Siklos®. Concomitant use of hydroxyurea with a live virus vaccine may potentiate the replication of the vaccine virus and/or may increase the adverse reactions of the vaccine virus and result in severe infections. Patient’s antibody response to vaccines may be decreased. Consider consultation with a specialist. Siklos® may cause macrocytosis, which is self-limiting, and is often seen early in the course of treatment. The morphologic change resembles pernicious anemia, but is not related to vitamin B12 or folic acid deficiency. This may mask the diagnosis of pernicious anemia. Prophylactic administration of folic acid is recommended. Siklos® should be taken once daily, at the same time every day, with a glass of water. For patients who are not able to swallow the tablets whole, they can be dispersed immediately before use in a small quantity of water in a teaspoon. Siklos® is a cytotoxic drug. Siklos® tablets must be handled with care. Advise patient or caregiver to read the FDA-approved patient labeling: Instructions for Use and Medication Guide. There is a risk of myelosuppression. Emphasize the importance of monitoring blood counts every two weeks throughout the duration of therapy to patients taking Siklos®. Please read Warnings and Precautions in Section 5 of PI. Advise patients to report signs and symptoms of infection or bleeding immediately to their HCP or, in case of emergency, to call 911. Advise patients that there is a risk of cutaneous vasculitic toxicities and secondary malignancies including leukemia. Advise use of sun protection. Please read Warnings and Precautions in Section 5 of PI. Advise females of reproductive potential of the potential risk to a fetus should they become pregnant while taking Siklos®. Advise patients to inform their healthcare provider of a known or suspected pregnancy. Advise females and males of reproductive potential to use contraception during and after treatment with Siklos® for at least 6 months after therapy. Advise females to discontinue breastfeeding during treatment with Siklos®. See Section 8.2 of PI. Advise male patients of potential risk to fertility. Advise patients with HIV infection to contact their physician for signs and symptoms of pancreatitis, hepatic events and peripheral neuropathy. See Section 7.1 of PI. Ferster, A. et al. 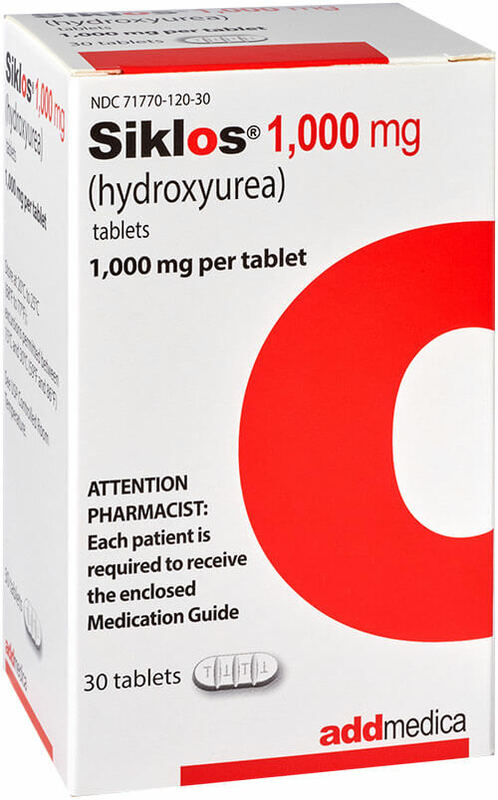 Hydroxyurea for treatment of severe sickle cell anemia: a pediatric clinical trial. Blood 88, 1960-1964 (1996). Ware et al. Hematology Am Soc Hematol Educ Program. 2015;2015:436-432. Strouse et al. Pediatr Blood Cancer. 2012 August ; 59(2): 365–371.